No wonder! You didn’t eat lunch! (jin1 tian1) (zao3 shang4) (a1) (wo3) (pao3 bu4) (hen3) (yuan3) (ou1)! This morning I ran very far! No wonder I am tired. My granddaughter will come visit soon, no wonder I am excited! 怪 (guai4) which here is most accurately translated as “to be surprised at” , “to wonder at”, or “to blame”. 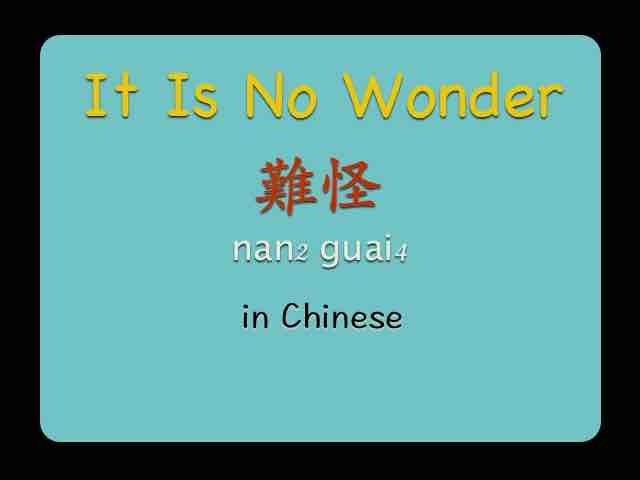 So the translation of the whole phrase to “it is no wonder” or simply “no wonder” is straightforward and used the same as the phrase in English. You buy this many clothes, no wonder you don’t have any money. Since you study that long, it is no wonder you know this much! You work that hard, no wonder they like you. I just got this cute, new kitten, no wonder I am very happy. That cat is not only small, but fast; no wonder it gets so much attention. Everyone is different, no wonder we also will see matters differently. 沒 (mei2) is more along the lines of “have not,” so it is not that something is an absolute negative, but it hasn’t been done at that point. It helps me to think about the words in the most common phrases that I have heard them in. 不要 (bu2 yao4) was some of the first Chinese I spoke out loud to a street vendor who was pestering me. The phrase 有沒有 (you3 mei2 you3) is common in front of another verb to ask if you have done something. ❷ For this sentence, one could replace 遠 (yuan3), a “long or far distance,” with 久 (jiu3), “a long time,” for an almost identical meaning. ❹ It English, when someone says they have a “new” pet, it means new to them or recently acquired in ownership. My tutor explains that would not be clear to Chinese speakers. There needs to be reference to how the pet was obtained. Was it purchased 買的 (mai3 de.) , adopted 認養 (ren4 yang3 de. ), newly come 新來的 (xin1 lai2 de. ), or given as a gift 人家送的 (ren2 jia1 song4 de.)? Or maybe the speaker is trying to say it is just born, as in 新生的 (xin1 sheng1 de.) . Each of these would be preceded by 剛剛 (gang1 gang1) “just now, barely” to add the full meaning.